Each August, my MD/PhD program holds a retreat that includes inviting alumni back to speak to the current students. This year, the theme of one of the alumni’s talks was “serendipity.” Defined as a happy accident, serendipity was a great way for her to describe how she came to her current career as opportunities arose that were best for her but did not fit a conventional career path in medicine. This same term applies to much of my path. It was serendipitous for me to even find out about MD/PhD programs – discovering they existed while looking at grad programs just days before taking the GRE – and apply to my specific school – being encouraged by an e-mail to apply – and it has turned out to be the perfect program for me. And so, I’ve learned to embrace of such pleasant surprises by keeping myself open to change as best I can to see where life will take me. Today marks the three-month mark of me living in Illinois. It’s crazy to realize that a quarter of a year ago I was making the move excited to start my new life in a new state as an MD/PhD student. Now, it feels like home. In that time, I’ve made many new friends who are grad students like myself, I’ve learned to live on my own, and I’ve adjusted to the responsibilities of being a graduate student. It has been a major change from my comfortable undergrad life in Minnesota where I had family nearby, roommates, and plenty of extracurricular activities to keep me preoccupied. As I’ve gone through my lab rotations, my research interests have also shifted in a somewhat serendipitous manner. In undergrad, I imagined my research to contribute to improving chemotherapy by developing more targeted small molecules as potential drugs. I rotated first in the one lab that was related to this and that I was interested in before coming to here, and it turned out to not be all of what I wanted in a lab. Fortunately, I found a lab that had not been listed as taking graduate students in the spring when I visited for my interview but was related to cancer therapy – immunotherapy for brain tumors, specifically – and so I took a chance and contacted the PI. It turned out that they were going to be taking rotation students, so I met with them before the school year began and we hit it off! They were actually going to a neuro-oncology symposium at Minnesota, my beloved alma mater, at the end of the first rotation and wanted to have me come with but I had already set up my first rotation so we agreed that I would do my second rotation in the lab and not go to the symposium. When I met with the PI again near the end of the first rotation, we confirmed that we were going to do whatever we could to be matched in the process of assigning labs. I was going to list the lab as my top choice and they were also going to request me as a student. The next day, we also figured out a way to get me to the symposium in Minnesota by asking my first rotation advisor if it would be alright if I took the last couple days of my rotation to go. They agreed and so I left on the Wednesday night before the symposium and drove 4 hours to Madison where I stayed with one of my best friends who just started a PhD program there. I left the next morning at 4:45 am and made it to Minnesota at 9, just a little late to the symposium but better rested than if I had woken up early enough to be on time for the 7:30 symposium registration. Being able to go to this symposium was possibly the best opportunity that I’ve had so far in grad school. I learned a lot about neuro-oncology and met many big names in the field. Most importantly, it inspired me as there is a cohort of researchers at Minnesota ranging from basic research to animal and human clinical research devoted to developing immunotherapies for brain tumors who all spoke at the symposium. My knowledge of immunology – and immunotherapy specifically – was limited since I had only superficially been exposed to the topic in my physiology and health psychology classes in undergrad, but I left that symposium really believing that triggering the immune system to attack cancer cells had the potential to be a much more effective mode of therapy than the slash, burn, and poison techniques that are currently used (surgery, radiation, and chemotherapy). It was also a great opportunity because it was homecoming so I was able to stay for the weekend, see many of my good friends, and go to the homecoming festivities for the first time as an alumna. 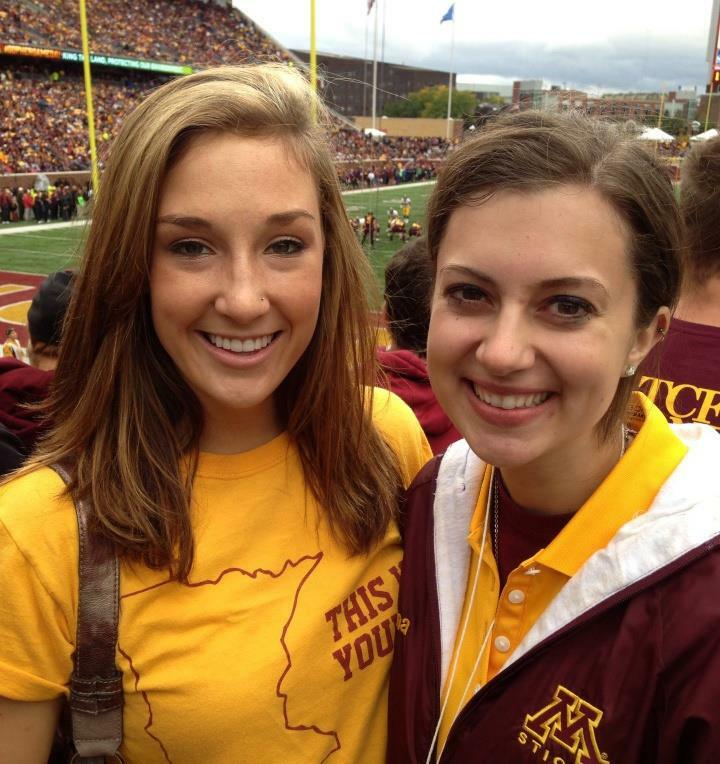 With my former roommate at the homecoming football game! As I said in my previous post, “The first rotation is the hardest,” the structure of a lab rotation can vary drastically depending on the lab. While my first lab had me working on a project of my own, my second lab had me essentially just observing. This lab is small with just a graduate student, three undergraduate students, and the PI, so there was less experimental work to observe. This gave me free time during the 5 weeks to research the literature and gain a more in depth understanding of immunotherapy and begin to formulate ideas of my own to pursue. While there was less lab work to observe, when there was something to observe it was something I had never seen before. As a chemistry major working in a medicinal chemistry lab in undergrad, my work primarily involved analytical chemistry with a little bit of tissue culture. On the other hand, this lab primarily does work with mice and so the first time I had ever worked with mice I ended up doing a little brain surgery to inject cancer cells into their brains, which they were going to live with for a week when we would collect some of their organs for immunohistochemistry. I had never been a fan of dissections (topic of a future post), but I actually enjoyed doing surgeries on mice. So you may be wondering what interests me so much about the immune system. Well, the immune system is the body’s defense against foreign antigens and so it can be activated to attack bacteria, etc. that are recognized as non-self. Human cells can also be recognized as non-self and can be attacked such as when a person receives an organ donation from a non-compatible donor and the body rejects the organ. To control the immune system and prevent it from attacking the body’s own cells, there are also immune cells that suppress the immune response toward an antigen. Since cancer cells arise from an endogenous (self) cell, they can be missed by the immune system even though they have altered expression of proteins that could distinguish them from normal healthy cells. Additionally, cancers tend to emit signals that promote immune suppression and thus prevent their destruction. I’m hopeful that better understanding this cancer-induced immunosuppression and finding a way of inhibiting it will be able to improve immunotherapies. You may also be wondering what interests me about brain tumors. Well, one in four cancers that spread throughout the body ends up metastasizing to the brain (about 170,000 will be diagnosed in a year) and the prognosis for these patients is generally poor. For those diagnosed with brain metastases, their life expectancy is usually less than 2 years. Brain cancers are also more difficult to treat because the blood-brain barrier is limiting for delivery of therapies. Therefore, there is an extra challenge in developing therapies, and I am always up for a challenge. 😉 This can be overcome by surgery, which is non-ideal to repeat because it exposes the brain, increases the likelihood of infection, and may not completely remove all cancer cells. As an alternative, immune cells can cross the blood-brain barrier easily, which makes immunotherapy a viable option for treating these tumors. Though I didn’t need to have a project of my own during my rotation, I was itching to have something to sort of call my own. I finally got my own project started at the end of the rotation that I’m continuing to my third and last rotation in a lab that looks at alterations in RNA splicing during development. I plan to use the RNA analytical techniques of that lab on samples from my second lab. In fact, soon after I began my second rotation, I established a collaboration between the two labs! Therefore whichever one I join, I can work with both PIs because I like both of them as well as their labs. Just 29 days until I can officially join a lab. Until then, I will need to decide which of these two labs I will be the best for me. Regardless, I should be able to do the science that I want to do, so now it’s just picking my primary lab and advisor. I have tremendous respect for MD/PHDs. I really do. It something I dont have the flair, talent or discipline to pursue. From reading the post, I got the sense that you enjoy what you are doing. Kudos to you gal.